12 TOBACCO INTERNATIONAL MARCH 2016 IRAN Heavy Iran 2016 Portends Industrial Modernization and Gradual Rapprochement tehran—The International Business Form (IBF Russia) presented the First International Conference Heavy Iran 2016 on April 27. The conference ad- dressed the changes expected in Iran based on the assumption that industrial modernization will result in "consid- erable volume of project cargoes" and that, in the next few years, "Iran may become a leader in utilizing services in the field of transporting and installing out-of-gauge and heavy items in Iran." IBF Russia's Heavy Iran 2016 cov- ered such topics as the potential of Iranian transport infrastructure (ports, roads, bridges); the sharing practice of delivering project cargoes in the direc- tion of Iran; and the particulars of state regulation of the transport sector. 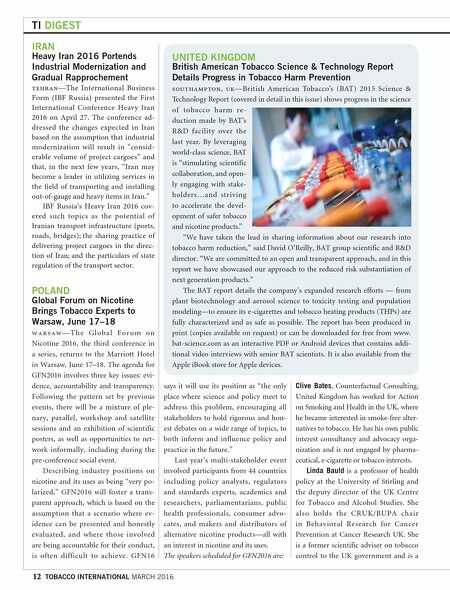 POLAND Global Forum on Nicotine Brings Tobacco Experts to Warsaw, June 17–18 w a r s a w — T h e G l o b a l F o r u m o n Nicotine 2016, the third conference in a series, returns to the Marriott Hotel in Warsaw, June 17–18. The agenda for GFN2016 involves three key issues: evi- dence, accountability and transparency. Following the pattern set by previous events, there will be a mixture of ple- nary, parallel, workshop and satellite sessions and an exhibition of scientific posters, as well as opportunities to net- work informally, including during the pre-conference social event. Describing industry positions on nicotine and its uses as being "very po- larized," GFN2016 will foster a trans- parent approach, which is based on the assumption that a scenario where ev- idence can be presented and honestly evaluated, and where those involved are being accountable for their conduct, is often difficult to achieve. GFN16 says it will use its position as "the only place where science and policy meet to address this problem, encouraging all stakeholders to hold rigorous and hon- est debates on a wide range of topics, to both inform and influence policy and practice in the future." Last year's multi-stakeholder event involved participants from 44 countries including policy analysts, regulators and standards experts, academics and researchers, parliamentarians, public health professionals, consumer advo- cates, and makers and distributors of alternative nicotine products—all with an interest in nicotine and its uses. The speakers scheduled for GFN2016 are: Clive Bates, Counterfactual Consulting, United Kingdom has worked for Action on Smoking and Health in the UK, where he became interested in smoke-free alter- natives to tobacco. He has his own public interest consultancy and advocacy orga- nization and is not engaged by pharma- ceutical, e-cigarette or tobacco interests. Linda Bauld is a professor of health policy at the University of Stirling and the deputy director of the UK Centre for Tobacco and Alcohol Studies. She also holds the CRUK/BUPA chair in Behavioral Research for Cancer Prevention at Cancer Research UK. 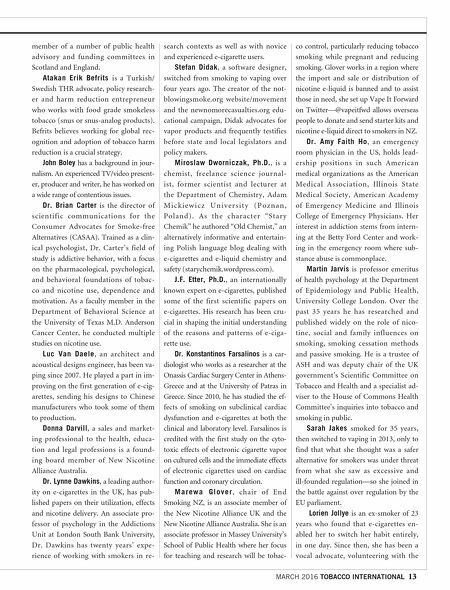 She is a former scientific adviser on tobacco control to the UK government and is a TI DIGEST UNITED KINGDOM British American Tobacco Science & Technology Report Details Progress in Tobacco Harm Prevention southampton, uk—British American Tobacco's (BAT) 2015 Science & Technology Report (covered in detail in this issue) shows progress in the science of tobacco har m re- duction made by BAT's R&D facility over the last year. By leveraging world-class science, BAT is "stimulating scientific collaboration, and open- ly engaging with stake- holders…and striving to accelerate the devel- opment of safer tobacco and nicotine products." "We have taken the lead in sharing information about our research into tobacco harm reduction," said David O'Reilly, BAT group scientific and R&D director. "We are committed to an open and transparent approach, and in this report we have showcased our approach to the reduced risk substantiation of next generation products." The BAT report details the company's expanded research efforts — from plant biotechnology and aerosol science to toxicity testing and population modeling—to ensure its e-cigarettes and tobacco heating products (THPs) are fully characterized and as safe as possible. The report has been produced in print (copies available on request) or can be downloaded for free from www. bat-science.com as an interactive PDF or Android devices that contains addi- tional video interviews with senior BAT scientists. It is also available from the Apple iBook store for Apple devices.